3 Bedroom Semi Detached House For Sale in Winsford for Offers Over £325,000. 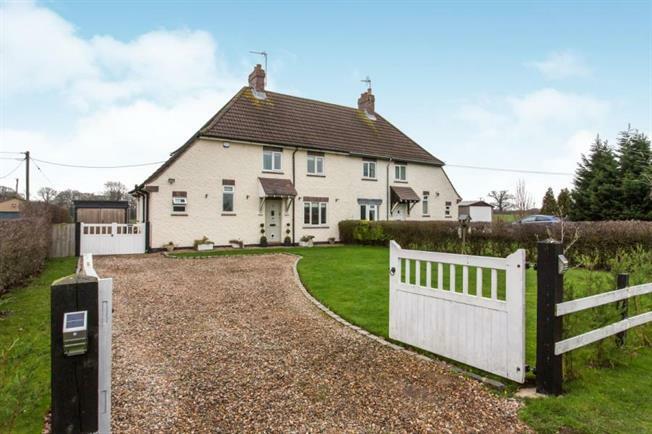 Looking for a stunning extended semi detached house in the country? Immaculate and well presented throughout? With beautiful interior design and amazing open plan kitchen/sitting/dining room? Look no further, this is it!!! Comprising of hallway, lounge, open plan kitchen/sitting/dining room, down stairs shower room to the ground floor. To the first floor, three bedrooms and bathroom. Externally, there is a fabulous garden room/office/gym, gravel driveway for 3 cars and garage. Situated in a quiet rural location approx 5 miles from Nantwich with fields to front and rear. Wooden front door, oak floor, under stairs cupboard, antique style radiator. Cast iron open fire place with wooden surround and tiled heath, oak floor, double doors to kitchen/dining area, antique style radiator, window to front, coving. Large extended open plan kitchen/sitting/dining room. Kitchen: tiled floor, wooden fitted kitchen with wall and base, oak work tops, tiled splash backs, integrated dish washer and washer/dryer, spot lights, extractor fan, two windows the side, space for Range style oven. Sitting/dining area: Tiled floor with under floor heating, window to side, full length windows and door the pation, skylights, spot lights. Shower room 6'7" x 5'3"
Single shower, WC, wall mounted snk, oak floor, part tiled walls, window to front, heated towel rail, extractor fan, spot lights. Carpet, window to front, loft access. Double bedroom with window to rear, two built in cupboards, carpet, radiator. Single bedroom with window to front, double fitted cupboard, oak floor, radiator. WC, double ended bath with mixer tap and hand held shower, wall mounted sink and mixer tap, part tiled walls, oak floor, spot lights, window to rear, heated towel rail, extractor fan. Alluminium frame garden room, full insulated and boarded walls, laminate floor, spot lights, rear and side doors and windows the side. Gate to front, lawns to front and rear, gravel driveway for three cars, side access to garage, stone patio to the rear, garden room/office/gym, fields to the rear. Single garage, power, light, double doors. Kitchen area 5.1m x 3.3m Dining & sitting area 7.2m x 2.8m Large extended open plan kitchen/sitting/dining room. Kitchen tiled floor, wooden fitted kitchen with wall and base, oak work tops, tiled splash backs, integrated dish washer and washer/dryer, spot lights, extractor fan, two windows the side, space for Range style oven. Sitting/dining area Tiled floor with under floor heating, window to side, full length windows and door the pation, skylights, spot lights.